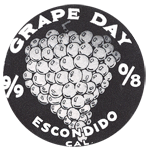 Grape Day started in 1908 as a way to celebrate Escondido's grape harvest and promote the city. It flourished until 1950 and was revived by the Escondido History Center in 1996. Each year in October*, our community comes together to celebrate Grape Day. This 5K fun run is for everyone from elite runners to casual walkers. For more information and to register go to www.escondidosunriserotary.org. *There will not be a festival in 2018. The Grape Day Festival includes live entertainment, kids’ activities, grape stomping, food trucks, and fun for the whole family. Go to www.escondidohistory.org for more information.